It's been almost 8 years(!) since we hosted something similiar on OFMan's Uhao and 4 years since the Lingor's Dictator Must Die MP event ;) many people enjoy this kind of fun gathering but we encourage serious approach and teamplay. This week I'll release Isla Abramia and one of better ways to get to know the island is to join our COOP event with several missions that progress in difficulty and firepower ;) slots will be limited to 40 this time. Original Arma 3 patched to 1.56 or latest stable patch + TeamSpeak3 Client for voice communication + microphone & headsets. 1. You need CUP (http://cup-arma3.org/)Core, Terrains, Weapons, Units, Vehicles. 2. Isla Abramia first public release with brand new FAP Units 0.69 (both addons planned for Thursday) - download will be around ~300MB. Few months ago an Ex-Abramian military chief General Dragan aka The Fox performed a coup d'etat on Isla Abramia and took control of the country. Overthrown president has been murdered in main square and all of his staff has been put to prison. Gen. Dragan set a curfew, requiring everyone to be indoors during night time. Massacres are on his daily schedule of all the people that oppose him and even innocent villagers are not safe anymore. UN has decided it is time to step in and remove Dragan with a small unconventional taskforce consisting of Slovenian SBP Team and a international group of professionals named TheExpeditionaryBattleGroup. This Joint Taskforce will be assisted by several talented individuals [you?] and maybe even a new team or two will assists us in the Op. We all start on the same side as Tourists. Official event language is English. We are unarmed at the start to avoid any suspicion with the airport security and need to link up with the local rebels. Dragan's troops are well trained and at start we need to avoid any direct confrontation or many good men will die. We don't want that, do we? There will be respawn enabled for reinforcements, and respawn points will move when certain objectives are met. Abramia is a small country and depends largely on Russian equipment, mostly light vehicles and armor. Couple of army bases provide transport and assault helicopters while airbases have couple of jets on the standby. Dragan increased air defenses as he is expecting foreign involvement, so do not count on any help from above any time soon. It is absolutely crucial to capture any assets we come across. Event will be hosted on SBP's dedicated server in Europe and teamspeak3 will be available. We are available for any questions in this topic. "REQ JOIN - Nickname - Team/Clan Name." X/Os and fight organizers please send only one topic with the list of all members that will be able to come to the event. We will update the player slots in this topic accordingly. You will recieve teamspeak, server data & pass to join on your private message at least few hours before the start. We reserved *40* slots for this mission. In case more of you apply, we might increase that. Taken: NEARLY ALL SLOTS FULL!! 32 out of 40 (reserved remaining for exclusive teams). Player slots updated, 12 player so far. What is your opinion, should we use ACE3+CBA or not for this event? Req Join Jeza, not overly comfortable with ace3 but if others are its cool. The community i am part of would like to participate, if possible could we reserve Team Delta? I have just informed them of the event and will know how many are interested by the end of the day (ill keep this post updated). We usually run with ACE3 and would prefer it but can play without just fine. Will ACRE or TFAR be used? would like to req 2 slots ;) We've got maybe a third guy from our group but he is not sure if he gots time. I will update this post if he wants to join the event. We're good with CBA and ACE3. EDIT: We're just two guys like listed below. We would like to fill. PS. - Is it the outdatet version from cup units from armaholic or the actual? Would it lag everyone too much if I joined from Western Canada. Would love to join in but don't want to ruin it if you would prefer European connections for latency and lag. You have PM cosmic10r to do a server/ping test. Hi, I'd like to request 4 slots. We're fine with being treated as "individual" if nothing else is available. You've been all added to the signup list. Mereck & TFI: You are assigned to Charlie squad where you will get couple of individuals under your command. I would love to join this event. Need one slot, i might have a friend or two that wants to join, will ask them tonight. How big will the dl be for the terrain? and im good for ace and cba. Also what is the expected length of the mission? granis: DL will be around 200-300megs max, if you have CUP Full preinstalled that is. So, we have 29 confirmed guests + 5 possible extras from several teams that will cooperate in this Joint Operation. All info will be available few hours before the event, first mission will have all the necessary briefing. 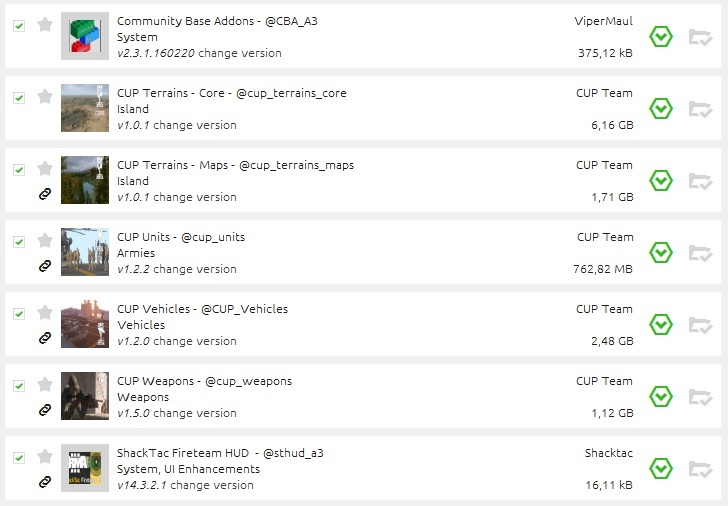 Make sure you have downloaded all CUP addons (Core, Terrains, Vehicles, Weapons, Units) and you're running a stable version of A3 1.56.x. In PM you will receive TS info where 4 channels are already set for all teams and individuals along with Abramia/FAPunits download link (hopefully also on PWS). At ZULU time we will pick squad leaders (RTOs?) that will become Channel Commanders in TS and able to speak to other squad leaders. Platoon will be lead by one of the squad leaders. We disabled ACE3 but make sure you have CBA_A3 enabled. If you have any questions, feel free to post. i would like to request one single slot. The server has a big X for me and says it is running 1.54. So I can't join it to see. What is an acceptable ping for an event like this. Im showing 180 ping in the browser. If that is too high I understand. So far you need to have these, extra will be @abramia and @fapunits coming later today! Our team uses PlayWithSix and you make a new collection and add these in. Of course you can do everything manually, too. I guess I should not join... I don't want to ruin it for you guys. Ill just have to enjoy the new map on my own. Mate, come by anyway and see how it goes? Hey, are slots allready full/other then recording press guys? if possible i want to join as individual player on the event.